December 2, 2013 Fort Worth, TX. - Derek Weaver Company continues to improve customer deliveries and overall value by adding a new warehouse and fulfillment center on the East Coast. The new warehouse will be stocked during December with their most popular lift models providing buyers in the Mid-West & East Coast States with exceptional freight savings and short delivery times. 1) Click “Add to Cart” for the product of interest. 2) Click “Proceed to Checkout” – requires no personal info. About Derek Weaver Company Inc. - Established in 1984 and headquartered in Fort Worth, TX, Derek Weaver Company specializes in providing lifts and shop equipment to automotive / motorcycle enthusiasts, car / motorcycle dealers, classic and collector car owners, astute collectors, and repair shops around the world. The company sells products from the highest quality manufacturers in the industry including the Direct-Lift, Weaver Lift, Forward Lift, K&L Supply and Weaver Equipment brands. 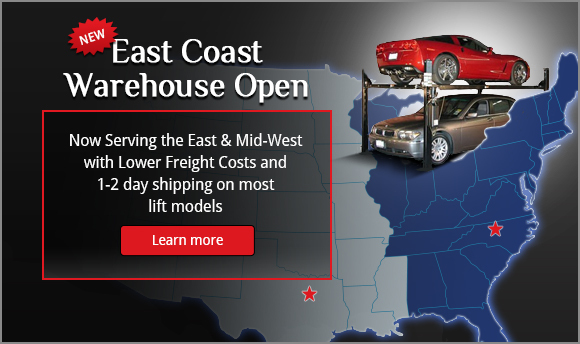 For more information on the new East Coast Warehouse visit their website at www.derekweaver.com or call 888-560-9510.